Worked in multiples of 4ch and through back loops of stitch throughout. of next 2tr, * miss 2tr, 1tr into each of next 2tr, 3tr into next tr, 1tr into each of next 2tr, * rpt from * to end, turn leaving 3 turning ch un-worked. 5th Row - (Inc Row) ss over first 2tr, make 3ch, 1tr into next tr, 5tr into next tr, 1tr into each of next 2tr, * miss 2tr, 1tr into each of next 2tr, 5tr into next tr, 1tr into each of next 2tr, * rpt from * to end, turn leaving 3ch for turning un-worked. 6th Row - ss over first 2tr, make 3ch, 1tr into each of next 2tr, 3tr into next tr, 1tr into each of next 3tr, * miss 2tr, 1tr into each of next 3tr, 3tr into next tr, 1tr into each of next 3tr, * rpt from * to end, ss to top of 3ch on beginning of row. Turn. 8th Row - ss over first 2tr, make 3ch, 1tr into each of next 3tr, 3tr into next tr, 1tr into each of next 4tr, * miss 2tr, 1tr into each of next 4tr, 3tr into next tr, 1tr into each of next 4tr, * rpt from * to end, ss to top of 3ch on beginning of row. Turn. Rpt 8th Row 7 more times until you have 15 rows worked. Fasten off. Join in contrast colour and work 8th Row three more times. Fasten off. Front Edging - Using 4.50mm hook rejoin main colour yarn to right hand side on base of front opening, make 1ch, 1dc into base of 1ch, work 10 more dc evenly along to neck edge, make 20ch for button loop, ss into side of dc. Fasten off. Working from neck down, work 11dc evenly down second side of front edge. Fasten off. Row 3 - ss over first 2tr, make 3ch, 1tr into each of next 3tr, 3tr into next tr, 1tr into each of next 4tr, * miss 2tr, 1tr into each of next 4tr, 3tr into next tr, 1tr into each of next 4tr, * rpt from * to end, turn leaving 3ch for turning un-worked. Work last row 3 more times in contrast colour. Fasten off. Row 13 - Rejoin main colour yarn, ss over first 2tr, make 3ch, 1tr into each of next 3tr, 5tr into next tr, 1tr into each of next 4tr, * miss 2tr, 1tr into each of next 4tr, 5tr into next tr, 1tr into each of next 4tr, * rpt from * to end, leaving 3ch to turn with un-worked Fasten off. Finishing - With WS facing and main colour yarn, over sew or slip stitch cast on edge together, work 48dc evenly along neck edge. 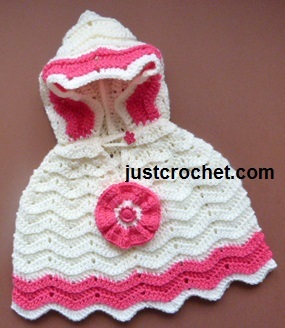 Attach Hood to Poncho - Working on WS slip stitch or over sew through dc on hood and cast on chain on neck edge of poncho. Fasten off. Round 4 - 3ch, 1tr into each tr to end, ss to top of 3ch on beginning of round. Fasten off. Finishing - Weave in ends, sew small decorative buttons to each of neck to correspond with button loop and centre of flower motif, attach flower to front of poncho.